Can-stack linear actuators contain a threaded rotor with a lead-screw shaft able to drive linear motion in both directions. The pressed steel body encloses precise internal components, which means this design delivers an economic solution for electrically driven linear motion. Step increments vary with the step angle of the motor, combined with the pitch angle of the lead screw, so each frame size has a range of step sizes available. The large range of applications for this versatile product means it must accommodate a multitude of requirements; both a captive anti-rotation shaft and non-captive screw shaft are available, with an external linear option for most sizes. The motor is available in either unipolar or bipolar configuration. For higher load applications, rare earth magnets can be selected, and all frame sizes are built using dual ball bearings for high load capacity and long life. Most of the can-stack motor range are capable of micro-stepping for even finer resolution and performance optimisation. Ø20 mm, 26 mm and 36 mm. Four basic frame sizes are available – Ø20 mm, Ø26 mm, Ø36 mm and Ø46 mm – as well as a series off extremely compact, Ø15 mm motors. 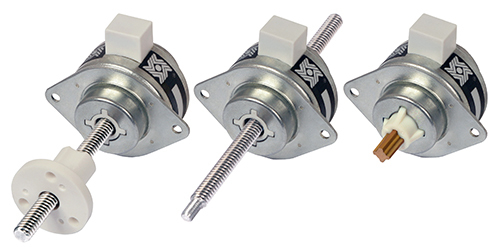 For finer steps, the High resolution 26000 and 36000 series features the smallest step capability in permanent magnet can-stack linear actuators.